A Filipino photographer’s book was recently recognized as one of the recipients of the prestigious “Steidl Book Award Asia” by renowned German designer, curator, and publisher Gerhard Steidl alongside other books by photographers from India, Singapore, South Korea, Japan, and China. 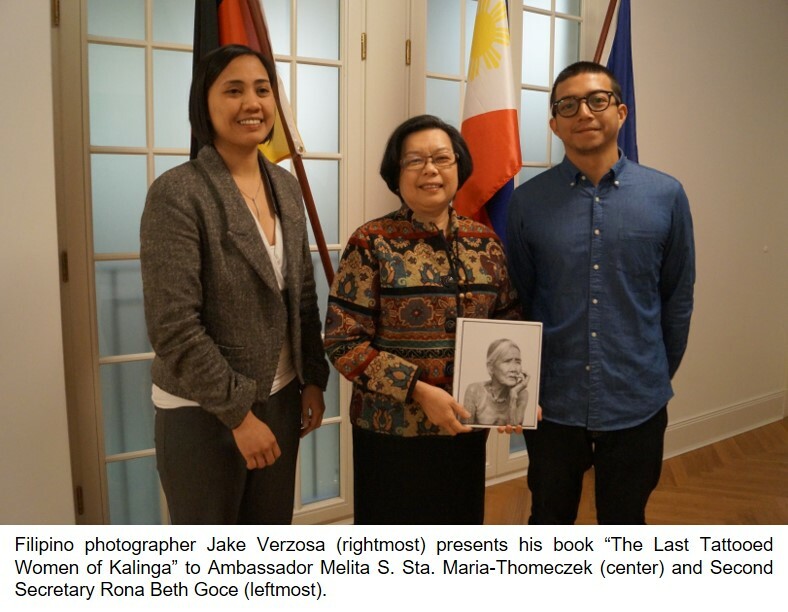 Filipino Photographer Jake Verzosa presented the Philippine Embassy in Berlin with a copy of his award-winning book “The Last Tattooed Women of Kalinga” during a courtesy call with Ambassador Melita Sta. Maria-Thomeczek on January 23. Winners traveled to Göttingen, Germany in January 2017 to work on the publication of their books which will be released collectively as “8 Books for Asia” later this year. Among the world’s renowned photographers and artists who are part of the Steidl program are Joel Sternfeld, Bruce Davidson, Robert Frank, Robert Adams, Karl Lagerfeld, Lewis Baltz, Ed Ruscha, Roni Horn, and Juergen Teller. “The Last Tattooed Women of Kalinga” presented a poetic romanticism of a seemingly dying tattooing culture among Kalinga women. “The main purpose of doing this was to document the last remaining people who adorn these tattoos and to hopefully reverse the changing perception of beauty among the Kalinga. The tattoos used to be a symbol of beauty, wealth, and honor but now, most see them as ancient, barbaric, and a stigma,” said Jake Versoza. “Naked arms in pictures of aged tattooed skin taken in the Philippines. Jake Verzosa’s digital black-and-white prints… showed women whose skin seemed to be patterned as if by a lacy sweater… It’s at one hand historical and on the other a sort of poetry unfolding as a record for posterity,” said Vogue International editor Suzy Menkes, lauding this particular series at Paris Photo 2014.